Psychedlic Electronica On This New Fututibile Release (sublabel From Periodica). 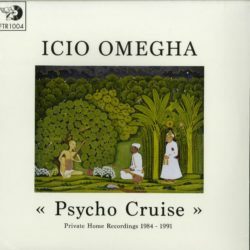 Icio Omeghas Psyco Cruise Is A Collection Of Songs And Private Recordings Made Between 1984 And 1991 In His Studio On The Island Of Stromboli. Icio Omegha. Formerly Known As Maurizio Aghemo. Is A Guitarist. A Sitarist And Keyboard Player Who Was A Member Of A World Music Band Active In The Late 70s (uco. Universal Condition Orchestra). Maurizio Today Is A Record Collector And Painter Who Runs His Art Gallery In Stromboli Where He Exhibits His Works. Currently Engaged In The Assembly Of A Modular System. He Continues To Produce Experimental Music On The Island. Over The Years. He Has Explored Various Musical Genres. From Ethnic Music With An Indian Flavor. Up To The Typical Electronic Digressions Of The Mid 80s. The Only Available Source Of These Recordings Are Original Cassette Tapes From Which Futuribile Made This Selection. A Small Selection With Pieces That Best Describe His Artistic Career. The Audio Was Cleaned. Re-mastered And Edited To Make The Best Possible Presentation Of These Unique Recordings Of Icio Omegha Who Is Finaly Able To Share Them With The Public. Recommended!! !